How Can You Pass up an Offer Like This? Back in late July of 2010 (actually, Picasa – and my camera – tell me it was on Saturday, July 24, 2010, at 2:45 PM) we were enjoying the Summer weather at Sycamore Cove State Beach here in Malibu, Caifornia. We had camped out in an adjacent site in Point Mugu State Park, which requires a short walk to a sand carpeted tunnel that takes you under the Pacific Coast Highway; very kid safe! I can’t recall if it was with the Indian Guides or the Girl Scouts, but we were there with a bunch other families and a bumptious horde of little girls. Despite my having recently undergone surgery to remove a Melanoma and a couple of lymph nodes (just to be sure it hadn’t spread, which it hadn’t), I was determined to spend some time on the beach. My wife had purchased both a long-sleeve, UV-resistant shirt and a large umbrella designed to corkscrew deep into the sand. I was able to sit in the shade pretty comfortably and enjoy my children and their friends – and a beer or three – frolic in the surf and sand. We had been there a couple of hours when this young man and two women came walking by. He was holding a sign that said “Free Hugs”. Most people were ignoring him but, being the old hippie that I am, I just couldn’t resist availing myself of his offer. Frankly, I think those who didn’t (and that was most everyone on the beach) were being disrespectful. 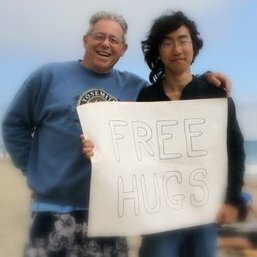 Here was a fellow human being who, despite all the fear in this world, was offering to hug perfect strangers. To tell you the truth, for all I know he could have been pledging a fraternity (though the timing wasn’t right) or working on some sort of thesis or paper (the timing wasn’t terribly propitious for that either). I really didn’t care. It just struck me as the right and decent thing to do. Besides, there is something magical about connecting with strangers in a very human way. Hugging is something we all do. Hell, even male professional golfers hug their caddies nowadays . . . at least after a victory! Notice I am carefully hanging on to my beer! It’s now well over a year and a half later and I’m still healthy, so I guess he wasn’t carrying any communicable diseases. Don’t think it didn’t cross my mind. 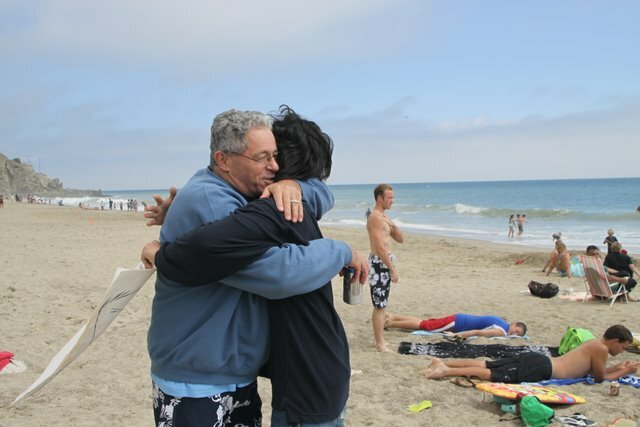 Regardless, I think we all can use a hug from a stranger now and again and after surviving my cancer scare I suppose this was just one way of my affirming I’m alive and kicking. Next time you see someone with a sign like this, go ahead a stick your damn neck out. I doubt you’ll be sorry you did. PS – Just in case you were thinking, “That Rick’s a lying SOB. He just took a picture with the guy for fun”, here’s the pic Linda took shortly after we posed for the one above. This entry was posted on Thursday, March 15th, 2012 at 2:55 pm	and tagged with beach, Beer, Camping, Girl Scouts, hugs, Humanity, Melanoma, Sun and posted in Personal, Random Thoughts. You can follow any responses to this entry through the RSS 2.0 feed.